Seven of the NBA Playoffs' eight Round 1, Game 2 fixtures saw the home sides pull away with a 2-0 advantage, but the fireworks were reserved for the exception, as the Spurs bounced back against the Clippers. It was another thrilling instalment to the post season, and here are the recaps for each game along with some notable statistics. John Wall went on a tear in Toronto as the Wizards' magical guard hoisted their series record to 2-0 in a rout for Game 2 of the first round, as the Washington contingent turned up to deliver another sensational performance. Toronto looked to feed off the unmatched energy in their home court and raced away to an early 12-2 lead, before leading by 5 points when the first 12 minute phase drew to a close. The second and third quarters witnessed an explosion from the field, going 27-39 while Kyle Lowry missed the final 9 minutes of the game picking up his second and third fouls to unravel any of the residual hope. Despite going on a 12-3 run, and putting the deficit within 2 points, 10 straight points restored the lead and they lead by 22 when the third quarter was boooed to an end by the home fans. It was straightforward from then on, cruising to their second win. Notable stats: Beal 28 PTS, Wall 17 AST, Gortat 3 BLK, DeRozan 20 PTS, Williams 20 PTS. Jimmy Butler torched the Milwaukee Bucks as they continued their clean slate in the playoffs rejuvenated by the returning Derrick Rose at the United Center. Shot after shot, there was no stopping Butler, who went on to take 31 points on the night. It was a sour start, though—with the shoote missing his first six shots from down-town, although in the 4th quarter he would nail all three pointers on 4-5 shooting to take the game away from Bucks' grasp. Pau Gasol was once again a force to be reckoned with, accumalating 11 points, 16 rebounds and 4 blocks. Noah surpassed those rebounds with 19 in a night where Chicago dominated the boards. Trailing early in the fourth, they were galvanized in the presence of Butler, triving down for a vicious dunk to kick start a 13-0 run, eventually taking them to victory. Notable stats: Jimmy Butler 31 PTS, Joakhim Noah 19 REBS, Derrick Rose 9 AST, Pau Gasol 4 BLK. LeBron James and Kyrie Irving once again linked up to dispatch the never-say-die spirit of the Boston Celtics edging closer to their Championship dream. Mimicing the first game between the two in this playoffs, the Cavaliers underwhelmed in the first half despite managing to obtain a slender lead. They managed to contain most players, at times even Irving, but they just couldn't stop LeBron James. 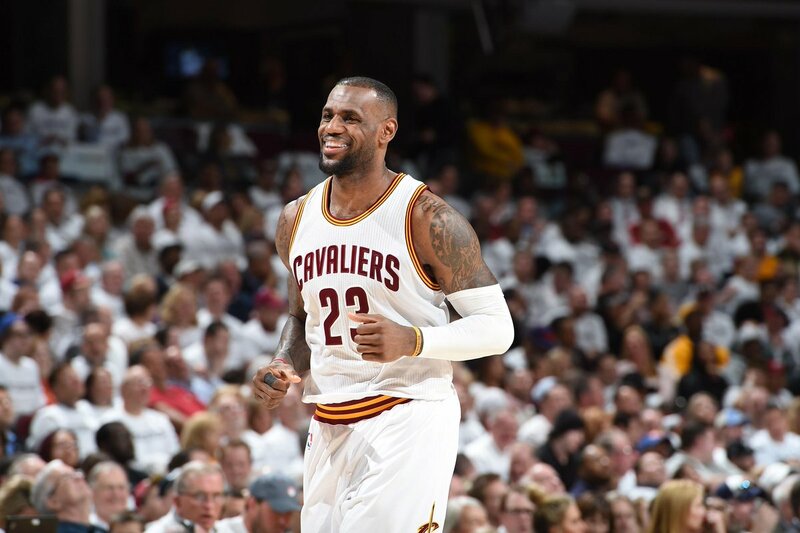 He unleashed in the second half, as they opened a 17-4 run at the start of the second half, with Love landing a marvellous reverse slam, Irving lobbing to LeBron on the rim and the trio working to gain some needed ground. Isaiah Thomas once again proved the searing force behind the Celtics, adding 22 points but it wasn't enough for Boston to cling on to. Clutch shots came by way of LeBron as the game winded down, and three offensive rebounds by Thompson kept the game out of reach against the valiant effort from Celtics. The Atlanta Hawks hardly took to the air, but they resiliently grinded to a second win over the Brooklyn Nets to keep their hopes well in tact. Paul Millsap overcame his shoulder issues while Al Horford played through a discloated finger in an edgy game that went down to the wire. When they were gaining ground early in the first half, no one would have expected the game to climax in such drama as it did. They let a 12 point lead slip and just couldn't shake off Brooklyn, before in the final quarter Deron Williams missed a jumper that would have tied the game, and the visiting team would come up short. Golden State Warriors defended their home court advantage with an astonishing performance to sink the New Orleans as the Splash Brothers came up big once again. Falling behind 13 points in the first quarter, Steve Kerr's side endured a sticky spell when Anthony Davis and Eric Gordon powered the Louisiana side to a 13 point lead after 1 quarter. The noise dampened, but not for long, when the Warriors were soon firing on all cylinders again. Before halftime, they tightened defensively and on the attack, they were pushed to lead until the remainder of the game—although New Orleans hardly allowed them to cruise to the victory. In the final minutes, just a point separated the two sides, but Green and Bogut swatted away before the latter went to the rim with a double-handed jam. That going along with Klay Thompson's 26 posted and Curry's 22 proved more than enough to go 2-0.
Notable stats: Anthony Davis 26 PTS, Klay Thompson 26 PTS, Steph Curry 22 PTS / 6 AST, Quincy Pondexter 4 STL. A turnaround from Josh Smith along with star performances from James Harden and Dwight Howard propelled the Houston Rockets past their fellow Texans, the Dallas Mavericks in the Toyota Center. A rocky start forced Smith to channel his inner-playmaker, and it caused chaos for the Mavericks when he got into form. With the Rondo saga continuing as a nagging sideline, and Chandler Parsons injured, it was an uphill climb from the start. Howard took advantage of Smith's passes to open up a barrage of points, with 11 in the fourth quarter taking the game out of reach. Notable stats: Dwight Howard 28 PTS / 12 REB, Monta Ellis 24 PTS. Portland Trail Blazers simply had no response for the ruthless defence of the Memphis Grizzlies. Off to a hot start though, it was looking good for Lillard's side, but similarly to Game 1, it just didn't last long enough. Their shooting deteriorated, mostly because Grizzlies were watertight on the offence. Portland rallied, but in vein, and Memphis held them off throughout the stretch to win by 15 points. Marc Gasol may have had a poor game shooting wise but on every other aspect he dominated the floor, with 15 points, 5 assists and 3 blocks. Notable stats: LaMarcus Aldridge 24 PTS / 14 REB / 4 BLK / 2 STL, Zach Randolph 10 REB. Breaking the pattern of all home sides winning and going 2-0, the Spurs and Clippers left the final dosage of drama in Round 1, Game 2. Another thrilling enocunter was on the books as the Spurs bounced back from their first loss to win in overtime. High levels of basketball were on full display on either side, and with the Clippers leading late at 94-92, Barnes intercepted Belinelli's pass, setting up Mills who was fouled and hit two free throws to send it to overtime. Popovich's men executed it perfectly, with Mills getting through the traffic and four free throws in the final seconds helped San Antonio to victory. Notable stats: Tim Duncan 28 PTS / 11 REB, Blake Griffin 29 PTS, DeAndre Jordan 15 REB, Blake Griffin 11 AST. On to Game 3—we can't wait. Recaps and stats from Game 2, Round 1 of the NBA Playoffs.